In a study conducted by Google in recent years, they showed that non-brand searches drive significantly more NEW visitors to your website than brand terms. Specifically, the study showed that 65% of visitors from non-brand terms were new, whereas only 15% of visitors from brand terms are new. YourAmigo has conducted numerous studies on client data over the years to fully understand the value of organic search and its ultra-long tail capabilities. In one of these studies, prior to search terms being hidden by secure searches, YourAmigo found that 98% of the phrases that were going through its service were non-brand. 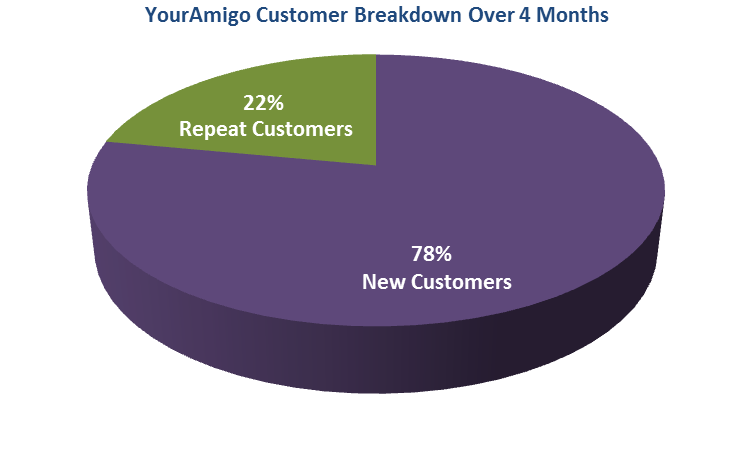 YourAmigo conducted another study to learn more about new customers. This study showed that 78% of customers generated through YourAmigo had not purchased through ANY online channel in the previous 4 months. The lifetime customer value of these NEW customers was very significant, and showed that YourAmigo drove more new customers than any other marketing channel.